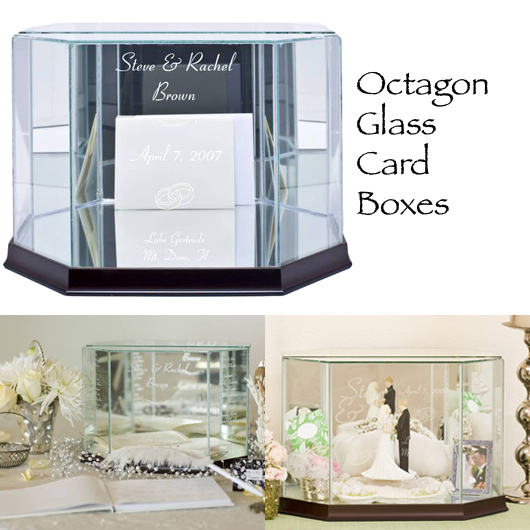 Personalized Glass Wedding Card Box Holder - Octagon - Medium - Our Medium Personalized Glass Wedding Card Box is a beautiful glass box to use on the gift table at your wedding for your guests to put their cards in. They make a beautiful keepsake for the bride and groom! This Glass Wedding Card Box is personalized and will hold treasured keepsakes after the wedding is over! For our octagon shapes, there are mirrors on the back three panels and on the bottom. Choose from 12 designs, 11 clipart, 4 fonts and 6 moulding choices below! Each Glass Wedding Card Box is engraved with the Bride and Groom's First Names, Last Name, Wedding Date and/or Location on the front panel. 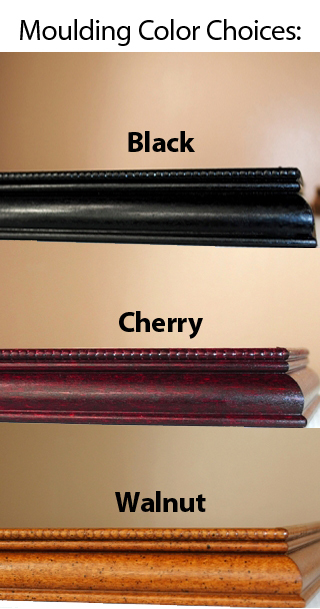 Additional engraving on 2 panels is available at an additional cost of $15.00, if you want to include the names of your attendants, or have a poem, prayer or Bible verse engraved. Please put in the comments section that you would like to have 2 panels engraved, and we will charge your card an additional $15.00 and send you a receipt. Then, send us an email with the extra engraving that you would like on the right and left front panels for the octagon shaped box, OR on the side panels for the rectangle shaped box. We will follow-up with you in an email to verify your information.